Maybe it's a sign of the tumultuous times, but the federal government recently wrapped up its biggest spending year, and its second biggest annual budget deficit, and almost nobody noticed. Is it rude to mention this? The bigger point: Government austerity is a myth. In somewhat better news, federal receipts grew by 6.5% in fiscal 2011, including a 21.6% gain in individual income tax revenues. The overall revenue gain would have been even larger without the cost of the temporary payroll tax cut, which contributed to a 5.3% decline in social insurance revenues but didn't reduce the jobless rate. The nearby table shows the budget trend over the last five years, and it underscores the dramatic negative turn since the Obama Presidency began. 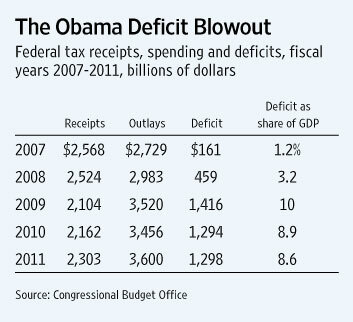 The budget deficit increased slightly in fiscal 2011 from a year earlier, to $1.298 trillion. That was down slightly as a share of GDP to 8.6%, but as CBO deadpans, this was still "greater than in any other year since 1945." Mull over that one. The Obama years have racked up the three largest deficits, both in absolute amounts and as a share of GDP, since Hitler still terrorized Europe. Some increase in deficits was inevitable given the recession, but to have deficits of nearly $1.3 trillion two years into a purported economic recovery simply hasn't happened in modern U.S. history. Yet President Obama fiercely resisted even the token spending cuts for fiscal 2011 pressed by House Republicans earlier this year. 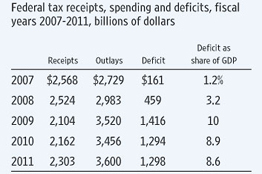 The table also shows how close the federal budget was to balance as recently as fiscal 2007, with a deficit as low as $161 billion, or 1.2% of GDP. Those are the numbers to point to the next time someone says that the Bush tax rates are the main cause of our current fiscal woes. 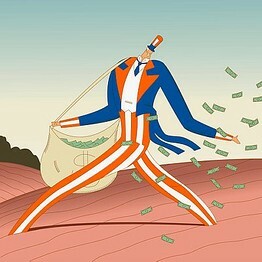 Under those same tax rates in 2007, the government raised $2.57 trillion in revenue but it spent only $2.73 trillion. Four years later, the government raised $265 billion less thanks to the tepid recovery, but it spent nearly $900 billion more thanks to the never-ending Washington stimulus. The lesson for Congress's super committee contemplating fiscal reform is that faster economic growth and spending restraint are the keys to reducing deficits. Higher taxes will hurt growth and feed a Washington spending appetite that is as voracious as ever, despite the claims of political sacrifice.